It's been a while, but I have finally added another demo to my site. Yay! Those of you wishing for some pretty eyecandy will be disappointed though. This demo features green spheres. But it's pretty cool though if you're into shader programming. It shows how to emulate a stack and recursive functions in a shader in DX10. In the fall of 1998 I enrolled at university. From that time I've had a small study loan. Now more than 10 years later I've finally paid it back. Funny enough, for a long time I could've paid it back at any time. But study loans are subsidized in Sweden, so it never made much sense for me to pay back any more than they asked for. It was better for me to just shove my money into a savings account since that gave me a higher interest rate. And for several years after I finished my studies they didn't even ask me to pay any. I suppose that's because while I lived in Canada I never had an income registered in Sweden. I think 2007 was the first year they required me to start making small payments. Anyway, I never paid more than I had to simply because it made no sense to do so. Now with the financial crisis the interest rates are dropping heavily. Meanwhile, the interest rate for study loans actually increased for 2009, for some obscure reason. So suddenly the interest rate for my mortgage is lower than the interest rate on the study loans, and that's not even counting the fact that my mortgage is tax deductible, unlike the study loan. So I had some money I had put aside for making a mortgage payment, but given this sudden change of things it made more sense to pay back the study loan instead. So I did. Whoohaa, wouldn't have expected another company to get into the HDR field so quickly, but Ricoh just announced the CX1 which also sports this features. They are taking a different approach though. Fujifilm went with a native HDR sensor, whereas Ricoh does the traditional combined exposures technique, except the camera does it automatically instead of relying on the user to do a lot of manual work at the computer to combine the images. It'll be interesting to see how well this turns out. It could potentially result in better image quality, but it could also be prone to mismatching exposures if you're shooting handheld, depending on the delay between the shots. It would also be nice if the camera did more than just two shots for greater dynamic range. With two vendors launching their HDR cameras so close to enough other I suspect we'll see more coming in the near future. In a few years we may be in a position where doing exposure digitally as a postprocess becomes as natural as doing white balance digitally. Speaking of white balance, another very interesting feature of the camera is "Multi-Pattern Auto White Balance". It's a quite common problem that different areas of a scene is lit with different light sources and require diffent white balance to look good, for instance shooting indoor with a window visible. The indoor and outdoor parts of the image will require different white balance settings due to the difference in light temperature. But cameras apply one white balance setting to the whole scene. So either the outdoor will look very blue or the indoor very yellow, or neither will look correct. This camera is supposedly capable to doing white balance locally. How well this will work will be very interesting to see. From the description it sounds like it's applying white balance on a tile basis, so I suppose areas with pixels affected by both light sources may still look bad. HDR has been kind of a buzz-word in photography for the last few years. Some of this may be related to that HDR has also been a much talked about subject in GPU rendering in the last few years as well. There are techniques for taking HDR photos with standard camera equipment using multiple exposures. We've also seen photographic packages such as Photoshop adding this functionality. Meanwhile there have from time to time been talks about new sensor technology for HDR photography, although little has seen the light of day. Last September Fujifilm announced their new Super CCD EXR sensor promising improved dynamic range. Now that's something we've heard before, so I didn't pay much attention to it. Just recently they released the F200EXR camera based on this sensor. It appears this might just be the first HDR capable camera on the market. I don't think it'll produce actual HDR images, but it can capture an 800% expanded range, or a 0..8 range if you will, tonemapped to a nice looking image where other cameras would either have to underexpose or get blown out highlights. The camera accomplishes this through pixel binning where different sensor pixels capture different exposure ranges. As a result, you'll only get a 6MP image instead of 12MP when using this technique, a tradeoff I'm more than willing to do. 12MP is already far beyond what's meaningful to put into camera anyway, particularly a compact. Since the camera is new there aren't many reviews for it out there, but I've at least found this Czech site which has some samples. If those are representative of what this camera can do this may very well be my next compact camera. A word of caution though. Looking in the EXIF tags of the pictures it seems they aren't all straight from the camera. Some have the camera name listed, others have "Adobe Lightroom", suggesting that they may have been processed in some way. The first sample pair lists the camera name though, so I'm going to assume at least those are unprocessed. In any case, this is a very exciting development. I hope to see similar technology from other vendors as well, and I would love to see this stuff in an SLR. 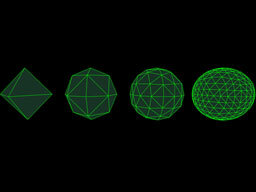 Multiplying a vector by a matrix is one of the most common tasks you do in graphics programming. A full matrix multiplication is generally four float4 vector instructions. Depending on whether you have a row major or column major matrix, and whether you multiply the vector from the left or right, the result is either a DP4-DP4-DP4-DP4 or MUL-MAD-MAD-MAD sequence. It should be mentioned that vs_3_0 has a read port limitation, and since the first line is using two different constant registers, HLSL will put a MOV instruction in there as well. But the hardware can be more flexible (for instance ATI cards are). In vs_4_0 there's no such limitation and HLSL will generate a three instruction sequence. 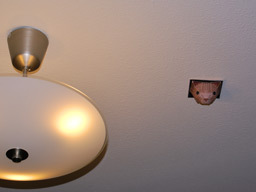 I can has ceiling cat? Yez I can! Also, I can has stikky fingurz from all teh glouh. Paper model available here. 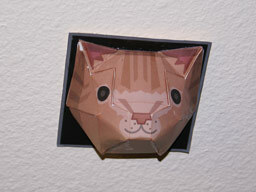 Print, glue and attach to ceiling. Intensity is now multiplied by 1.7, which is a single operation, and then the result is multiplied with color, which is 4, for a total of five scalar operations. A save of three instructions by merely placing parantheses in the code. Shouldn't the compiler be smart enough to figure this thing out by itself? Not really. HLSL will sometimes merge constants when it considers this safe to do. However, when dealing with variables that have values with unknown range the compiler cannot make the assumption that multiplying in another order will give the same result. For instance 1e-20 * 1e30 * 1e10 will result in 1e20 if you multiply left to right, whereas 1e-20 * (1e30 * 1e10) will result in an overflow and return INF. In general I recommend that you even place parantheses around compile-time constants to make sure the compiler merge them when appropriate. High recognition factor for anyone in game development. And good entertainment even if you're not.